A few weeks ago here at Doc’s, we gave you our recommendations on which player would lead the NFL in receiving yards in 2010. Well, a tight end is never going to lead the league in yardage in this modern NFL, so Bodog also offers a prop on which player from that position has the most yards this season. Last year only three players exceeded 1,000 yards among tight ends: San Diego’s Antonio Gates (a career-high 1,157), Indianapolis’ Dallas Clark (1,106) and Dallas’ Jason Witten (1,030). A couple of other players, the Eagles’ Brent Celek and 49ers’ Vernon Davis, were within sniffing distance of 1,000 but, really, those five tight ends seem to have separated themselves from the rest. Bodog currently lists three favorites at 5/1 to win this prop: Gates, Witten and a bit of a surprise, Green Bay’s Jermichael Finley – a guy many consider the next great tight end in the league. Davis is at 7/1 and Clark at 15/2, while every other tight end has at least 10/1 odds. It’s hard to argue against any of the favorites. Gates plays in an offense that will be very pass-happy with the Chargers breaking in a new rookie running back in Ryan Mathews. But will Gates be hurt or helped by the fact top receiver Vincent Jackson may not play a down for San Diego this year? I would argue hurt because the threat of Jackson opened up the middle of the field for Gates. 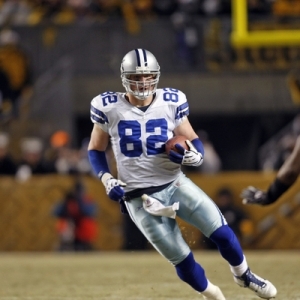 As for Witten, among active tight ends only Tony Gonzalez has more catches than Witten and only Gonzalez and Gates have more yards in their careers. Yet if you read a lot of previews of the Cowboys, most expect a bit of a dip in Witten’s numbers with the emergence of WR Miles Austin, the likely impact of rookie WR Dez Bryant, and a bigger role for RB Felix Jones. I tend to agree with that. Finley is entering just his third season and broke out in 2009 with 55 catches for 676 yards and five touchdowns. Coach Mike McCarthy has all but guaranteed a Pro Bowl spot for Finley as long as he avoids a major injury. The guy has such an upside that Finley will be used essentially as a slot receiver some this season, and he’s clearly Rodgers’ go-to guy now. Plus, add in that Rodgers looked like Joe Montana this preseason and the Packers might throw more than anybody. Oh, Finley did lead all tight ends in the preseason with 163 yards receiving. I’m a tad surprised Celek is such a longer shot at 15/1 as his numbers have gotten significantly better in each of his first three seasons. In two games with Kevin Kolb as the Eagles’ starting QB last season, Celek caught 12 passes for 208 yards and a touchdown. He was pretty quiet this preseason as Kolb struggled. Still, at 15/1 Celek is great value. And so is Houston’s Owen Daniels at the same price. Daniels was having his best season in 2009 (40 catches, 519 yards, five TDs) before tearing his ACL in Week 8. He got back late into camp but says that knee is now 100 percent. And the Texans will be airing it out plenty with a questionable running game. The one concern is Daniels snaps may be limited in the first few games so as not to rush him back. I haven’t mentioned arguably the best receiving tight end in history: Atlanta’s Gonzalez, who is 10/1. I just worry about his durability at age 34 (even though he has missed only two games in his career) and he had his fewest yards last year (867) since 2002. And don’t overlook Oakland’s Zach Miller at 20/1. He had 805 yards last season mostly playing with JaMarcus Russell, which makes that even more impressive. New Raiders QB Jason Campbell has a reputation for relying heavily on his tight end (ask Chris Cooley) so Miller could have huge season. Robert Ferringo is a writer and a professional college football and NFL handicapper for Doc’s Sports. Last year he brought home +62.5 Units for his clients for NFL picks and he is regarded as one of the top totals players in the sport. He guarantees a winning football season this year or he will work for free until you turn a profit. He has a very rare 7-Unit NFL Total of the Month coming this weekend! You can sign up for his college football and NFL picks and get more information here.